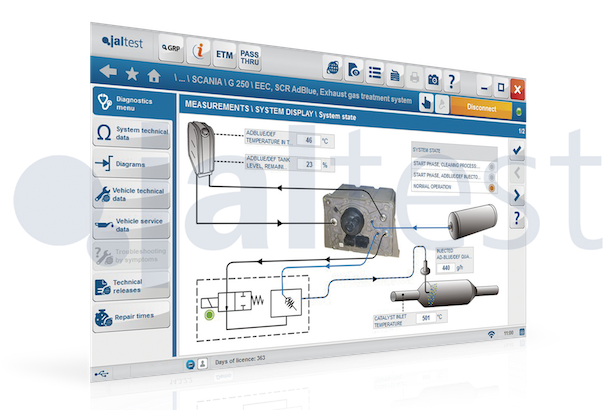 Jaltest, represented in Ireland by AGE Ltd hast released its first software update of 2019, version 19.1, which includes a number of significant updates. Jaltest 19.1 offers more improvements and innovations that consolidate this tool as a benchmark in multibrand diagnosis for commercial, agricultural and OHW (Off-Highway) vehicles. – Troubleshooting guides for software error codes. – New viewer for PDF reports. – Data recorder and player. – Action search function by model. – Actions associated with maintenance services. – DAF EBS Euro Gen 3, measurements for vehicles with 3 axles. – Mercedes-Benz, CNG bus models. – Carrier Vector, troubleshooting guides. – Renault Master, AdBlue/DEF dosing system. – Fendt, technical data of the engine types Deutz and MAN. – Yanmar, new brand that includes advanced diagnosis. – ZF Ergopower EST-37, extension of the technical information and diagnosis coverage.